People with celiac disease are allergic to gluten, the main protein in wheat, rye, and barley, which causes a T-cell mediated inflammatory reaction that damages the lining of the small intestine. Researchers recently identified the immunotoxic peptides in gluten and established ImmusanT in Cambridge, MA, to advance a vaccine and diagnostic tools for the disease. While an estimated 1% of the population worldwide is affected by celiac disease, the only treatment to date is a gluten-free diet, which most patients find difficult to live with. “It’s been 60 years since gluten was discovered as the environmental cause of celiac disease. The holy grail has been to identify its toxic peptide components,” says Bob Anderson, Ph.D., M.D., CSO and CMO at ImmusanT, and head of the Walter and Eliza Hall Institute’s celiac disease research laboratory in Melbourne, Australia. ImmusanT was founded by Leslie Williams, president and CEO, in 2010. The company acquired the discovery platform for targeted immunotherapeutics from Nexpep, the Melbourne-based company that developed Nexvax2®, a peptide-based immunotherapy. Dr. Anderson and colleagues discovered that three gluten-derived peptides, gliadin, hordein, and secalin, cause the majority of the T-cell immunotoxicity triggered by gluten. They did this by measuring the immune response to 2,700 different gluten peptide fragments in the blood of 200 celiac disease patients after they ate bread, rye muffins, and boiled barley. Nexvax2 is an equimolar mixture of the three peptides in saline manufactured under cGMP standards. The safety, tolerability, and bioactivity of Nexvax2 were confirmed in a Phase I trial of 34 adults with celiac disease who received weekly intradermal injections of Nexvax2 or placebo for three weeks. “Celiac disease is the first human immune disease for which there is a comprehensive understanding of the pathogenic Tcell response,” says Dr. Anderson. Nexvax2 was designed to reprogram and desensitize the disease-causing T cells triggered by the patient’s immune response to gluten. The ultimate goal is to reduce gluten-caused inflammation of villi in the small intestine and return them to a healthy state that can absorb nutrients. The treatment is similar to allergy shots for cats, ragweed, and other environmental allergens. Based on current data, ImmusanT foresees that Nexvax2 dosing will likely begin with an induction phase of three shots weekly for a month, followed by a maintenance phase of a single injection given once weekly or monthly. Future clinical trials will determine whether, in the long-term, full tolerance or a cure, which allows patients to eat a normal diet, will be achieved. 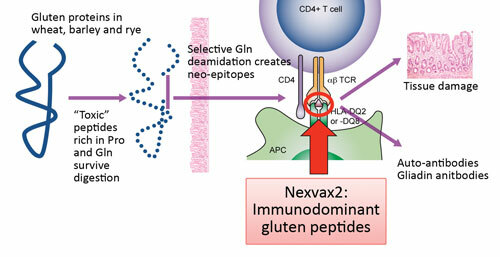 Pathogenesis of celiac disease: Nexvax2 targets the underlying mechanism, reprogramming disease-causing T cells with small doses of peptides from the disease-causing proteins. In addition to a vaccine, ImmusanT is creating diagnostic screening tests for celiac disease. Its whole-blood ELISA test measures the activity of T cells that cause celiac disease. Diagnostic blood tests will be used to select patients who are most likely to respond to the vaccine and to monitor their response to treatment. Most celiac disease patients carry the HLA-DQ2 gene, but their symptoms vary. For example, some patients do not have gastrointestinal symptoms, but instead suffer from skin disorders. “A diagnostic test based on functional T cells will identify subpopulations of patients in whom our immunotherapeutic will be effective,” says Williams. Then patients receiving Nexvax2 will be monitored to evaluate the effectiveness of the dosing schedule. The diagnosis of celiac disease now requires an endoscopic biopsy in order to take multiple tissue samples from the small intestines. A stand-alone diagnostic tool could potentially replace invasive biopsies as a definitive diagnostic. The company also has a commercial agreement with Inova Diagnostics to develop improved serology diagnostic screening tests for celiac disease. “It takes about nine years before a patient with symptomatic celiac disease receives a diagnosis. We want to shorten that time with better diagnostics,” says Williams. ImmusanT is building a suite of diagnostic and therapeutic tools similar to those used to control other allergies. Allergy patients are first challenged with skin tests to identify immune responses to a particular allergen, then they are treated with injections of the same allergen. “In our case, it’s a different type of immune response—the right T-cell response—that makes patients eligible for the vaccine,” says Dr. Anderson. A few other companies are working on therapies for celiac disease, but they differ in the targets under attack. “We focus on the heart of the disease, the immunologically induced inflammation triggered by the ingestion of gluten,” says Williams. Competing approaches involve proteases that break down gluten, used in conjunction with a gluten-free diet, or targeting tight junctions in the intestinal wall to block damage. “We have a unique position because we know how the peptides drive the disease, and we hold a robust intellectual property position based on that knowledge,” explains Dr. Anderson.